You can find my work at the Torpedo Factory Art Center in Alexandria, Virginia, in studio 226, Adorn. 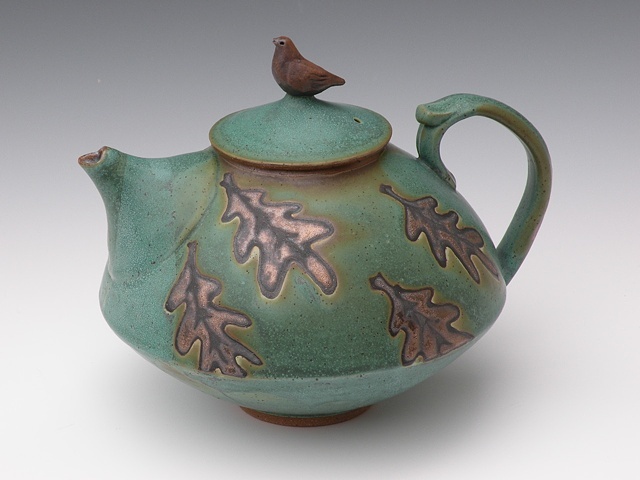 I create teapots, vases, bowls, platters, oil lamps, brie bakers, birdhouses, pitchers, and many other forms. I mainly work in blue and green glazes and red-brown raw clay. Images like birds, spirals, and leaves decorate the work. Most of the pottery on this website is sold, but I'm always making more. Call me if you want a similar piece to one you see here. Of course, since each piece is hand made on the potters wheel and individually glazed, there are no two exactly alike. I hope you enjoy perusing these pictures. Let me know how you like them!